Liquid caramel used in many different classic desserts like caramel Panna cotta or creme caramel, put it into the cupcakes and decorate her cakes, pour into ice-cream, served her pancakes and cheesecakes. The recipe is not complicated, but there are a few subtleties. 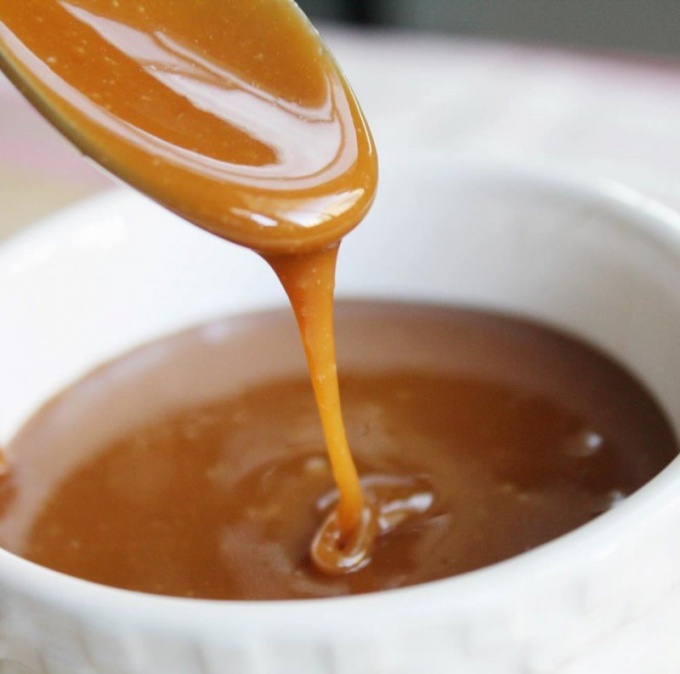 The simplest liquid caramel is made with just two ingredients: sugar and water. At the initial stage, you will need two parts sugar to one part liquid. Combine them in a saucepan, place on low heat and stir until the sugar is dissolved. Then increase the heat to full. Boil the syrup, mixing until it becomes Golden. It is most convenient to determine the readiness of liquid caramel in culinary thermometer, it should show 195оС. Do not leave the caramel unattended, it may burn for a few seconds and you will not be able to get rid of the burnt taste. Once the caramel will change color, start to add water. Be careful as you can burn spray. You need to pour as much water as you added originally. Add water, beat the caramel with a whisk. Once it emulsifies, then there will be a single substance, turn off the heat as the caramel is ready. - ¼ Cup of cream 20% fat. In some recipes you want salted caramel. To do this you need to add to the sauce at the initial stage of preparation of ¼ teaspoon of salt. Mix in a saucepan sugar and water and cook them, stirring constantly, until all sugar is dissolved. An important condition - if the sides of the pan are sugar crystals, shake them into the caramel using a wet brush, silicone, so they are not burnt and do not spoil the taste of the entire dish. Once the sugar has dissolved, increase the heat to maximum. Cook the caramel, stirring until it starts to bubble. After 3-4 minutes when the mixture will turn from light amber, the color of the home of condensed milk, reddish-brown, add butter and pour in the cream. Whisk the caramel until all the ingredients come together. If the caramel will be too liquid, do not boil it longer. You will need to make a second batch, reducing the proportion of liquid in half and then in the second stage, to merge it with the first. To flavor the caramel in it is not possible to add a few drops of alcohol such as rum, brandy, sherry. The finished caramel should be poured into the vessel and close the lid or tighten with cling film. It can be stored up to two weeks in the fridge, taking 5-10 minutes before use. If after cooling the caramel becomes liquid, it should heat up and then add a little water or cream. If you want to cook the caramel is using homemade heavy cream, do not put oil into it.